You put a lot of effort in choosing the best tile and stone for the floors, showers and countertops of your home. They give your home depth and beauty. But with time the tile and stone in your house starts to lose color and shine they had when you first bought them. 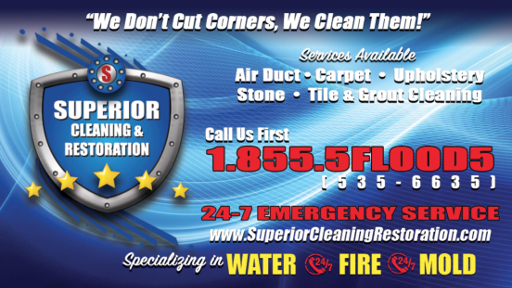 Superior Cleaning and Restoration Inc. is extending their services to the people of Oceanside. We clean the tile and stone in your house to help them regain their natural glow. Whether it is marble, granite, travertine, porcelain or terrazzo, we are experts in cleaning them all. We also clean grout. We scrub the grout between the tiles thoroughly to give you the clean lines you had when you first installed them. There are many reasons why tiles begin to dull. Dirt, cleaning solutions and particles build up over time making your tiles lose color and a glossy look. You may clean your house regularly, the DIY kit and daily cleaning products are unable to reach the difficult places to clean the tiles entirely. Debris gets trapped in the pores of tile, stone and grout and is very difficult to get rid of. Our truck-mounted cleaning system efficiently and effectively cleans the tiles on your floors, showers and countertops. This removes the dirt and debris. A specialized cleaning solution which is made especially for stone, tile and grout is then applied. Further, we use our powerful equipment to vacuum away all the remaining dirt to give you perfect results. For a lasting effect, we use a penetrating sealer to protect the tile and grout from any further staining and mildew. We use advanced technology, qualified technicians and make it our responsibility that your tile and grout gets cleaned to your satisfaction.